Gillian Eva Golden’s perceptive and very readable account of her day at the Summit. To start on a personal note, being a vaper and living in Ireland, looking at how attitudes to vaping have changed and evolved in Britain, and in particular England, the past number of years, can feel somewhat jarring. Research is supported, organisations have had re-thinks and position statements have changed, potential is identified and evidence is scrutinised so that incorrect public perceptions are not at risk of taking hold. I often find myself reminding vaper friends there that they shouldn’t take this change in attitude for granted, but rather to give credit where due, even when it might feel like the smallest gap in understanding or policy position might feel like a canyon. Working as I do for an Irish trade association of retailers, mere days away from the EU TPD notification deadline I therefore set off for the e-cigarette summit in London last week fully prepared for more of the previous restrained and cautious positivity from researchers and policy makers as was present last year. Others will have gone into more detail of the individual speaker’s presentations, so rather than repeating that I’d like to share an overview of the event and a few things at this year’s event which surprised me somewhat. First, was the new rule of being allowed to vape respectfully inside the event venue, the stately Royal Society on Carlton House Terrace, in St James’s. I noticed lots of people vaping at the coffee and lunch breaks and I doubt there were any complaints – either from those with a more negative view of the products, or those who were able to shelter from the rather chilly London air. Vaping indoors can still be a contentious issue, yet here was a good example of it not needing to be. An area was designated for those who did not wish to be in the same area where vaping was allowed, and people mingled and chatted amiably. It’s difficult to imagine a similar Irish event extending vapers the same courtesy so I would like to extend my thanks to the Royal Society and the Summit’s organisers for that. Second, was the attendance of Ram Moorthy, representing the British Medical Association. The BMA’s overly cautious and sometimes seemingly (at least in the eyes of vaping advocates) hostile approach to vaping products, to this outsider, could certainly be responsible for some of the misperception of the relative risks of vaping. As illustrated by Prof Peter Hajek in an earlier presentation, the number of people who incorrectly perceive vaping products to be more harmful or more harmful than cigarettes has increased in the EU (27% in 2012 to 52% in 2014) and in the US (13% in 2012 to 40% in 2015). It wouldn’t be too much of a stretch to imagine a smoker asking their doctor about vaping ending up confused or put off, only to find that the Royal College of Physicians say that vaping should be recommended widely. The Royal College of General Practitioners have also recently issued a position statement and recommendations for GPs on the use of vaping products. Is this more cautious approach by the BMA in place because they mistakenly treat vaping as a medicine? Do they have access to the resources that might rectify knowledge gaps? Will their position statement change before their next assembly meeting? We shall wait and see. Third, was the unuttered acceptance by both those presenting and the audience of a very simple fact – that the benefits of vaping instead of smoking outweigh the risks. (Even Prof Neal Benowitz from the University of California, San Francisco, who could arguably be seen as this year’s devil’s advocate, presenting as he did on the possible outcomes of the long term use of nicotine, agreed so). Well of course it does, I hear you all say – but unfortunately here in Ireland, this is often only uttered in public by ourselves in the industry, or media hosts, who can sometimes sound desperate to bring an interview with both ‘’sides’’ of a ‘’debate’’ to a middle ground. And that brings me to my next point – that of ‘’sides’’ in a ‘’debate’’. For unfortunately, that is still broadly the situation here in Ireland. Proponents of vaping here are still met with suspicion, and the default decry of accusation as to why this is so, is that the only people who could possibly be in favour of having smokers switch to vaping are those with a financial stake in if that happens. These were the take home messages on offer at the summit this year, and from the delegate list in the event programme, I was delighted to see that a representative from the Irish Department of Health was in the audience to hear them. Which brings me to my final point of surprise, and that is that this year’s summit saw the sharing of the stage by regulators and the independent industry. Presentations by Beryl Keely of the MHRA and Allette Addison of the Department of Health were followed by Fraser Cropper of the IBVTA, and then all three were joined on a panel by the senior policy executive from the Committee on Advertising Practice, the head of a market analysis company, and a Professor at the Mayo Clinic who is past president of the Society for Research on Nicotine and Tobacco. Those of us in the industry will have our own views as to the answer to that. That this question will at some point be asked in Ireland, is something the IVVA wishes for the good of Irish vapers and smokers, as well as for its members. Sincerest thanks to the E-Cigarette Summit for understanding that it’s necessary to ask this question in the first place, and also for illustrating how important it is that people from all viewpoints – including, most importantly, the independent sector – should have an open forum to answer it. 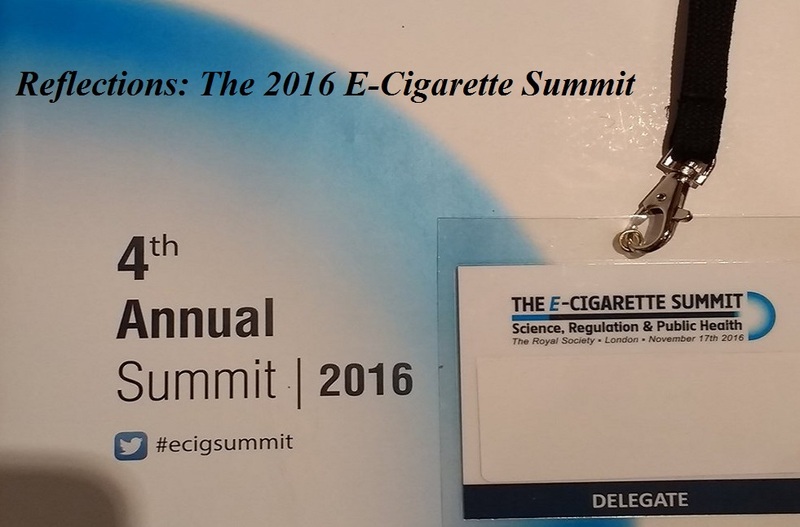 2 Pings/Trackbacks for "Reflections: E-Cigarette Summit ’16"